This is how I can justify blogging as a scientific activity: once in a while, I find something really useful. Case in point is this post on the ‘blog of Pamela Ronald, the chair of the University of California Davis plant genomics program, which points to a new in the last volume of PLoS ONE that predicts (perhaps not surprisingly) climate change is going to be bad for rare plants in California. Photo by Jeremy B. Yoder. The effect of climate change on plant communities is a major concern for me, because the range of my favorite woody monocot, the Joshua tree, may have to change quite a bit to compensate for a warmer climate. 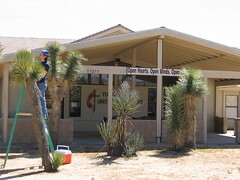 (For reference, see the photo of me setting up a pollination experiment on a Joshua tree in front of the Yucca Valley United Methodist church.) Previous projections have suggested that Joshua trees are going to be in trouble under a warming climate. Back in 2006, Science ran a cover article suggesting that climate change may make wildfires more frequent [$-a]. That’s a very real problem for Joshua tree’s range in the Mojave Desert – my lab has already lost field sites to brush fires in only about half a dozen years of focusing on Joshua trees. Another, more recent study has suggested that climate change is going to make the southwest U.S. even more arid&nbsp[$-a], which is also, obviously, a bad thing for plants (and people) in the region. Earlier work of this sort usually modeled how climate change might increase or decrease the distribution of individual plant species – big, showy things like Joshua tree, Saguaro cactus, giant Sequoias. Loarie et al. improve over this by projecting changes in whole plant communities across the California floristic province. And they predict that up to 66% of plants endemic to California will lose more than 80% of their ranges. That’s a lot of diversity – more than just my study organism – at stake. In the original version of this post, I conflated the state of California, which does include a lot of Joshua tree’s range, with the California floristic province, which doesn’t. So Loarie et al.‘s new paper doesn’t directly impact Joshua trees. But it’s still cool/alarming, and decidedly post-worthy. In making that correction, I’ve also inserted a more recent study of climate change in the U.S. southwest, by Seager et al. Loarie SR, BE Carter, K Hayhoe, S McMahon, R Moe, CA Knight, and DD Ackerly. 2008. Climate change and the future of California’s endemic flora. PLoS ONE 3:e2502. Seager R, M Ting, I Held, Y Kushner, J Lu, G Vecchi, H-P Huang, N Harnik, A Leetmaa, N-C Lau, C Li, J Velez, and N Naik. 2007. Model projections of an imminent transition to a more arid climate in southwestern North America. Science 316:1181-4. Westerling AL, HG Hidalgo, DR Cayan, and TW Swetnam. 2006. Warming and earlier spring increase western U.S. forest wildfire activity. Science 313:940-3. This entry was posted in science and tagged climate change, Joshua tree, scientific methods by jby. Bookmark the permalink.